We join our census enumerator around lunchtime on 6th June 1841 when he has completed the first part of his allotted task by taking the census on Wish Road (later, Albert Road) and has reached the point on Wish Road where today's Festing Road branches off to the south. There were two dwellings at that junction, one on the north side of Wish Road and one on the east side of 'Festing Road'. In his census schedule he described both as being on Lump Lane. The first might equally well have been included on Wish Road but the latter was definitely on the branch road that led south, towards Lumps Fort, known as Lumps Lane. It was all one road with no branches so it was not unreasaonable to think of the whole as Lump or Lumps Lane. The enumerator noted down the occupants of the two houses who were John Beard, his wife Betsy and four children in one and James Mack, his wife Mary with six children in the other. Beard would turn up in the 1861 census as the first landlord of the Bold Forrester, a public House on Albert Road. In 1841 however, both were described as Agricultural Workers which was hardly surprising as the two houses were surrounded by arable and pasture land. The enumerator would have known that having done this he was in for a long walk as the next entry on his Schedule was for the White House at Milton Bridge. There were no other dwelling places for him to visit on his journey which would have been along tracks marking the edges of ancient field boundaries. Those tracks survived to form the basis of the modern road network which allows us to say that the enumerator's route would almost certainly have taken him along tracks that we now know as Highland Road, Haslemere Road, Devonshire Avenue and Winter Road bringing him to a bridge over the Portsmouth and Arundel Canal which was sited at what is now the junction with Goldsmith Avenue, adjacent to the Shepherd's Crook Public House. It is interesting to note that the bridge was known as Shepherd's Bridge which may well have accounted for the name of the Pub. From there a path ran along the north side of the canal which would have taken him to the Milton Bridge on the south side of which was the White House, then the home of Thomas Sutton, a Beershop Keeper, his wife Sophia and two other females, one possibly his sister Harriett and the other a child named Ellen Seaford. A Public House called the White House was first built on the site in 1742 and survived in one form or another for over 250 years until it closed in 2011. After perhaps stopping for a beer at the White House, our enumerator took the Eastney road south where after a few hundred yards he came across a cottage on the east side of the road. Therein he recorded the occupier as James Toms a 56 year old fisherman, with his wife Harriett and daughter Caroline. A short distance further south he arrived at a junction with the road to Fort Cumberland, now Bransbury Road, and turning off he walked along it until he reached Eastney Farm. The location of the farm has been remembered in the naming of Eastney Farm Road, which is off Bransbury Road. The land around that part of Eastney would have been farmed for generations but records do not tell us by whom until 1627 when it was in the possession of a Mr. Cotton. In 1716 the farm passed to James Osmond, a member of a much persecuted Baptist sect that practised baptism in a small pond adjacent to the farm building. By 1722 the farm and land had been acquired by the future mayor of Portsmouth John White after which, according to William Gates, it passed via his son Thomas to his grandson William and thence to his niece Mary White (other sources describe Mary as John White's daughter). On her death in 1831 the estate passed to Ann, the wife of Admiral Sir Philip Charles Calderwood Henderson Durham. In his section on Portsea Farms Stephen Pomeroy records that in 1839 the tenant at Eastney Farm was James Ellis but in the Electors lists for the early 1840s Ellis actually gave his address as 'Milton'. The Tithe Map Schedule states that Ellis was the tenant at both Eastney and Milton Farms. Our enumerator supported the view that Ellis was not living at Eastney in 1841 as he recorded the presence of a yeoman farmer named Robert Jolliffe, his wife Thirsa, who was the daughter of James Ellis, and 2 children together with pensioners Joseph Whitewood and Richard Bird with a 16 year old Maria Cleves. This is slightly confusing in that the term 'yeoman' (as defined by Wikipedia) was 'a person who farms their own land' and Jolliffe certainly didn't own the farm. Returning to the Eastney Road the enumerator resumed his walk south until he reached a small house on the east side of the road. There are feint lines drawn on the map next to this house showing where in the near future Highland Road would emerge to join Eastney Road. It is hardly surprising therefore to find out that the dwelling was known as Highland Cottage, which was the home of Robert Dighton, a 50 year Army H.P, and his three young children, one only 7 months old. There is no sign of a wife but there are two other apparently unrelated women in the household, Anna and Eliza Toms, 28 and 15 years of age respectively. Could they have been daughters of James Toms at the Milton cottage further up the road? And more teasingly could Anna Toms have been the mother of Dighton's children given that in the 1851 Census Dighton declares a wife named Anna who would have been much the same age as Anna Toms. From the cottage, the enumerator continued south down what is now Cromwell Road and then St. George's Road until he had almost reached the sea. There, a road we now know as Eastern Parade branched off to his right but he would have known that this was the other end of Lumps Lane and that by walking along it he would arrive at a farm complex known as Lumps Farm which was located roughly in the area now occupied by Spencer and Cousins Road. 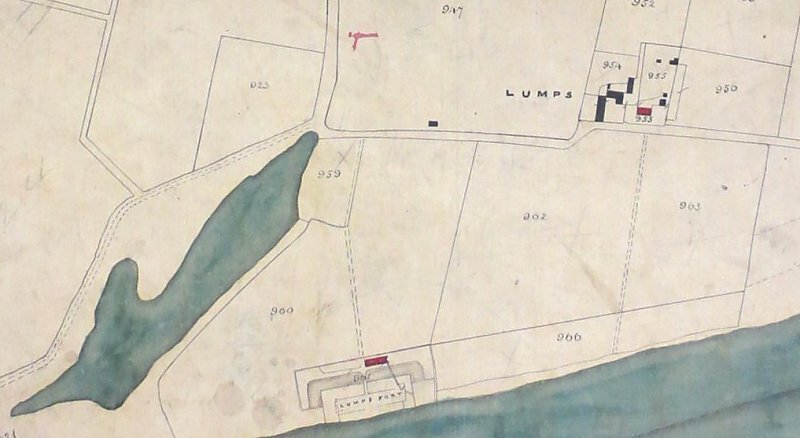 Although the Tithe Map shows only one small residential building on the farm the enumerator has recorded dwellings called Lumps Farm, Lumps Cottages and Lumps Mill which must have been part of the same group of buildings as there is no other housing shown on Lumps Lane. The farm is recorded as being the home of Jonathan Gain, a 52 year old Naval H.P., his wife Jane and six children with a 21 year old Ann Bradley who may have been a servant. Lumps Cottages were occupied by Reuben Hibbs, an Agricultural Labourer, his wife Elizabeth and five children whilst at Lumps Mill were Mary Ballard, described as a Miller with her five children. Our enumerator has now almost reached the end of his days work, but there is one final entry in his Schedule, that of Seymour Cottage with it's occupants, William James, a gardener, his wife Elizabeth and two children. It is not immediately obvious where this cottage might be but there is one more building marked in red, to mean residence, in the area and that is in front of Lumps Fort. Quite why a Victorian fort would require the services of a gardener is unclear but in the absence of further information we must assume that they did. In a way that would be a nicely prescient given that after World War 2 Lumps Fort was turned into a Rose Garden.